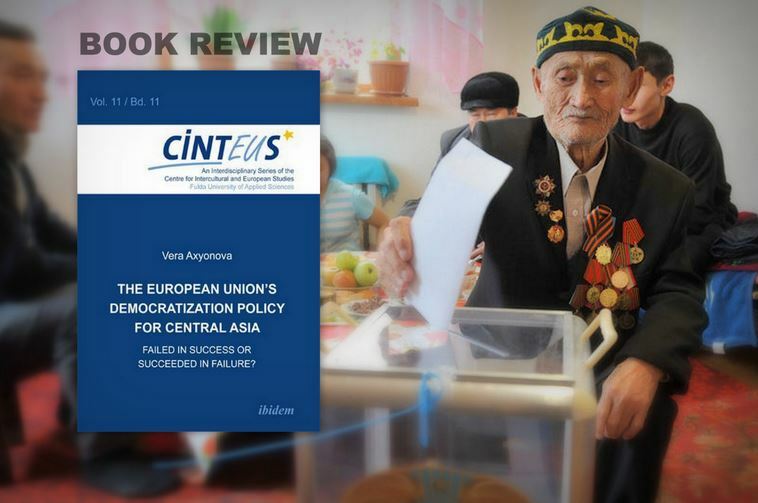 BOOK REVIEW | The European Union's Democratization Policy for Central Asia: Failed in Success or Succeeded in Failure? Home / Book Review / Central Asia / European Union / Opinion / BOOK REVIEW | The European Union's Democratization Policy for Central Asia: Failed in Success or Succeeded in Failure? The European Union’s Democratization Policy for Central Asia: Failed in Success or Succeeded in Failure? presents a much-needed analysis of the European Union’s (EU) democratization efforts in the post-Soviet states comprising Central Asia. This book bridges the gap between academic studies and the practical application of tools designed to promote democracy, good governance, and the rule of law in authoritarian regimes. According to Vera Axyonova, the EU pursues democracy promotion around the world; however, the effectiveness of its resources diminish outside of its immediate sphere of influence. This is in large part because the EU’s avenues for influence are limited; it cannot, for example, extend the possibility of EU membership to these states in exchange for democratic reforms. As Axyonova demonstrates, the five post-Soviet states in Central Asia—Kazakhstan, Kyrgyzstan, Tajikistan, Turkmenistan, and Uzbekistan—pose a unique set of challenges for the EU in their democratization promotion efforts and lack a more thorough examination by both scholars and practitioners. As identified in the first chapter, the book’s research is driven by a set of interrelated questions about the success of democracy promotion efforts. The author seeks to identify whether the EU’s initiatives resulted in normative shifts and substantive reforms favoring democracy and to measure the degree of success (thus allowing for a comparison across different types of democracy promotion efforts) of specific types of tools, as well as to explain variations in degree of success across cases. The research design allows for some comparison between states embracing higher levels of liberalization (Kyrgyzstan) and authoritarian states (Uzbekistan). Interestingly, the case of Turkmenistan, arguably the most authoritarian state in Central Asia, is not selected for analysis because, as the author notes, the Partnership and Cooperation Agreement (PCA) has not been ratified, thus limiting the EU’s toolkit. However, it could be argued that this case would better benefit the research because it further narrows the scope of analysis for the remaining EU tools. Nonetheless, the chosen states reflect a carefully crafted research design in order to maximize the explanatory value. A comprehensive review of the literature, integrated into the first three chapters, identifies the need for such frameworks, encompassing tools from a variety of research areas including EU and democratization studies as well as regional studies on post-Soviet state development. The author identifies significant gaps in the existing literature—namely, that research conducted on democratization efforts in Central Asia focus primarily on the EU’s motives and strategies without a more thorough analysis of the successes and failures of its efforts. Furthermore, as demonstrated in the second and third chapters, democratization studies more generally suffer from a number of analytical problems, including poor identification and classification systems, unclear connections between the objectives and achieved outcomes of democracy promotion efforts, and the applicability of existing analytical frameworks to the EU’s efforts in more challenging environments such as Central Asia. The second chapter disaggregates the EU’s normative and substantive definitions of democracy to further understanding of the objectives, resources, and outcomes of democracy promotion efforts. To understand the role of external democratizers (in the case, the EU) with these states, Axyonova employs a mixed rationalist-constructivist approach, allowing for a more comprehensive understanding of the motives of both parties as well as the effectiveness of different types of democratization promotion resources. This chapter also establishes a typology of resources employed by the EU to address the shortcomings of both existing EU policy prescriptions and the academic literature. This results in the categorization of EU democratization resources into one of three distinct areas: conditionality-based tools, dialogue-based tools, and democratic empowerment. Unlike previous typologies, which allow for some EU resources to fall into more than one category, the typology developed in this book captures not only the utility of the tool but also the expected outcome, thus providing a more distinct categorization system and preventing resources from belonging to more than one category of tool. The third chapter continues the disaggregation of policy approaches and scholarly literature, focusing on the development of new conceptualizations necessary to answer the set of research questions concerning the success of the EU’s democratization efforts. This chapter also isolates the hypotheses that drive the research design: in states where the domestic and external conditions are unfriendly to democratization efforts, the success of the EU’s toolkit will be determined by its ability to promote norms and changes that are not directed at politically sensitive areas. Conversely, if the EU’s efforts target politically sensitive areas, they will likely be unsuccessful. The resulting research design uses qualitative evidence and process tracing to identify causal relationships. In addition to using existing data, chapters 4 through 6 include interviews with policymakers, practitioners, and representatives of civil society from both Europe and Central Asia. Chapters 4 through 6 provide in-depth analyses of three cases of the EU’s employment of various democratization tools in Kyrgyzstan and Uzbekistan. The first case concerns the application of sanctions against Uzbekistan following protests in the city of Andijan in 2005. The second case examines bilateral Human Rights Dialogues (HRD) established by the 2007 “Strategy for a New Partnership” in both Kyrgyzstan and Uzbekistan as an example of dialogue-based tools. The final case examines the European Instrument for Democracy and Human Rights (EIDHR) and the Institution Building and Partnership Programme (IBPP) in both states as well as examples of democratic empowerment. In each case, the findings are largely consistent with the hypotheses proposed in the first three chapters of the book. Whereas conditionality-based tools have only been applied in Uzbekistan in the aforementioned case of the 2005 protests in Andijan, the challenge to the regime’s authority from the protests increased the sensitivity of the regime to the EU’s initiatives, thus making the likelihood of success low. However, the evidence revealed some potential indirect effects the sanctions may have had on compliance, thus suggesting partial success. In the latter two cases, analysis of each case was enhanced by cross-case comparisons. Both cases confirmed the previous assumptions regarding the relationship between sensitivity and compliance, while analysis of the success of dialogue-based tools (chapter 5) and democratic empowerment tools (chapter 6) yielded mixed results. This book provides valuable analyses of the EU’s democratization efforts in Central Asia, overcoming many of the difficulties of prior scholarly research and practical applications and filling important gaps in the understanding of the role of external democratizers. It identifies the lack of universality in evaluation methods of EU democratization efforts, particularly in Central Asia. It also rightly demonstrates the need for an expansion of frameworks to evaluate the successes of EU resources relative to their intended objectives. The framework employed here does not fully realize a mechanism for integration into practice-oriented evaluations, which raises questions as to its ability to bridge the gap between academia and practice in terms of using the framework to evaluate other/all EU efforts. Though the book’s integration of qualitative and quantitative evidence provides a more thorough examination of the selected cases, it also raises questions as to the applicability of the framework outside of academia—namely, the feasibility of using the framework on a broader set of cases to initiate change in the EU’s democratization strategies. Additionally, even with implementation of the framework proposed in this book, several of the methodological challenges identified in chapter 3 remain, particularly the isolation of causal mechanisms in cases involving more than one external democratizer (such as the United Nations or the United States). Furthermore, as acknowledged throughout the book, the number of cases of the EU applying conditionality-based tools in Central Asia are limited to the 2005 case of Uzbekistan, prompting the need to expand analyses outside of Central Asia to more fully understand the utility of these (and other) tools. Nonetheless, Axyonova’s book provides a useful starting point for a more nuanced, explanatory method for understanding the relationships between Central Asian states and the EU in regard to democratization. The research conducted here provides several opportunities for promising future research initiatives, many of which are discussed in the final chapter of the book. Frameworks established by the book promise to have a more universal application to other cases outside of the EU’s spheres of influence, as well as to non-EU cases of external democratization. Vera Axyonova is an EASI-Hurford Next Generation fellow at the Carnegie Endowment for International Peace. Her research focuses on external democratization and human rights promotion, civil society development, and security in post-soviet Eastern Europe and Central Asia. Axyonova is also a post-doctoral researcher and lecturer at Justus Liebig University Giessen and Fulda University of Applied Sciences in Germany, and an associate researcher with the Europe-Central Asia Monitoring program at the Madrid-based think tank FRIDE. Julie Garey is a doctoral candidate specializing in international relations and comparative politics. She teaches courses in international relations, U.S. foreign policy, and research methods. She was a visiting lecturer at Tufts University, where she taught a course on U.S. national security and the future of NATO. She has also been a teaching assistant (TA) in international relations, comparative politics, and globalization courses. In addition to her responsibilities in the department, she has also served on various focus groups and committees, as well as working as a project assistant to the Center for Emerging Markets, an inter-disciplinary organization within the NEU College of Business. In Spring 2015, Julie was awarded a Northeastern University Dissertation Completion Fellowship. This work was originally published at H-Net Reviews under a Creative Commons Attribution-Noncommercial-No Derivative Works 3.0 United States License.